Registration is now open for the 2019 SAT Prep Class at BCHS. This is for BCHS students only. This is a 6-week SAT Prep class, taught by BCHS teachers Mrs. Schaffner and Mrs. Hilton, in January-February. Each class runs from 6:00 p.m. – 8:00 p.m.
Class dates are Wednesdays : January 23, 30, 2019 and February 6, 13, 20, 27, 2019. March 6 will be used as a makeup day in the event of a weather cancellation. This class covers Math and English on the revised SAT. Cost is $150. All registration is online. Payment will be collected during registration through our secure form. The class is limited to 40 registrants and spaces fill quickly. COLLEGE APPLICATION DEADLINES: Please be aware of application deadlines for your schools. Most schools have an Early Action deadline and this gives you better consideration for admission and scholarship. It is best to have all of your applications submitted by November 1. Please remember that transcripts and letter of recommendations must be requested at least 10 days before the due date. CUMULATIVE GPA/PAST GRADES: You will need your cumulative GPA for college applications. In some cases, such as if you are applying to Purdue, you will also need to input all of your high school courses and grades. A copy of your current transcript was sent to your parent/guardian email address on file around noon on 10/18 to help you access that information. Your cumulative GPA is the one listed next to Grade 12. TEST SCORES: ORDER YOUR TEST SCORES NOW. This is the number one thing that prevents students from meeting deadlines or being considered for specific scholarships. 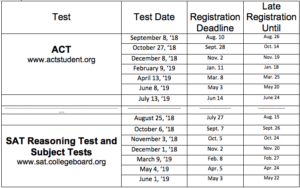 Test scores have to be ordered by the student directly from the testing service (https://collegereadiness.collegeboard.org/sat/scores/sending-scores; https://www.act.org/content/act/en/products-and-services/the-act/scores/sending-your-scores.html) and sometimes take 2-3 weeks to arrive to the colleges. COMPLETE APPLICATIONS. As soon as you complete your information, please click submit on your applications. Do not wait for your teacher recommendations or counselor form. COMMON APPLICATION: If you use the Common Application, transcripts are submitted automatically. Optional reports, midyear reports, and final reports do not need to be submitted at this time. PARCHMENT:If you have colleges that are not on the Common Application, please submit transcript requests through Parchment. We do not receive notifications from these schools, so you have to tell us what you need for non-Common App schools. SCHEDULE CHANGES: Please remember that colleges admit you based on your schedule at the time of your application. If you make changes to your schedule after first semester, you will need to notify each college to which you have applied. REQUIRED MINIMUM GPA: Please remember that the Honors diploma requires all semester grades to be a C- or higher and your cumulative GPA to be above 3.0 at the time of graduation. 21st Century Scholars must have a minimum 2.5 GPA to receive those funds. FINANCIAL AID PRESENTATION: There will be a financial aid presentation at 6:30 on October 23 for senior parents in room 102. CELEBRATE: When you are admitted to a college or receive a scholarship, please notify Mrs. Alerding or Mrs. Nixon. We need copies of all letters for school data purposes, as well as for Honors Night, the bulletin board in the hallway, the website, and recommendations for other outside scholarships. You can now view your PSAT scores online with your CollegeBoard login. Counselors will deliver the paper score reports to homerooms after Christmas break. If you use your PSAT scores correctly, you can improve your SAT scores, increase your academic potential, and focus your college search. When you log into your CollegeBoard account, you will first see your most recent scores. 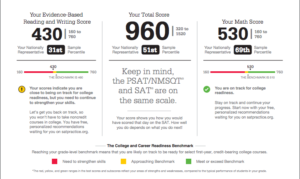 For information on how to “Get the Most from Your Score Report,” view the PSAT video: https://youtu.be/nzCSIilL3WQ. You will be able to view your total score as well as the subscores and benchmarks. The percentiles and benchmarks are useful to see where you have room to improve, but do not panic if you do not yet meet the benchmarks. The purpose of a practice test is to help you know where you can improve, and your BCHS counselors are here to help you prepare now to meet the benchmarks on future tests. 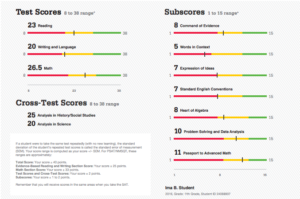 The subscores demonstrate smaller areas of proficiency or areas of improvement. You will be able to break down the larger areas to see where you can focus your preparation before you take the SAT. This allows the study and preparation process to be less intimidating. For example, one week you can focus on questions that deal with Words in Context and then move on to Expression of Ideas rather than feeling overwhelmed and not starting at all. For Juniors Only: This section shows you your National Merit Scholarship eligibility. If there is an asterisk next to your NMSC selection index number, you do not qualify for the scholarship program. As discussed in junior Theology classes, a high index score is still beneficial to you in other ways. Please see Mrs. Nixon for more clarification. This section of the report really breaks down your strengths and areas of growth. You can build confidence by seeing what you already do well (on the left) and continue to learn more about where you have room to improve (on the right). Using the suggestions in the right-hand column truly does give you the chance to focus your energy on improving your skills. This section of the report allows you to view every question you missed, the correct answer, and your incorrect guess. 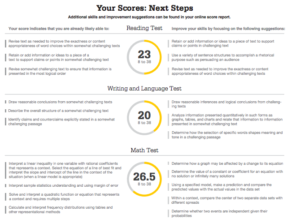 You can break down where you went wrong on your incorrect guess, the reasoning for the correct answer, and what you can expect going forward when you take the SAT. 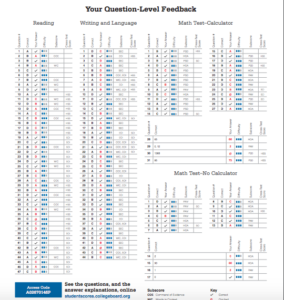 This is such a valuable tool for you as you set up your Khan Academy account and complete practice questions for your future College Board tests.